The following article was written by my friend, Walter Williams. Walter saw value in my book, The Chicken Little Agenda, and gave me a wonderful endorsement. When I read the following article, I emailed him for permission to republish it here. I trust you will enjoy it as much as I did. Our nation is rapidly approaching a point from which there’s little chance to avoid a financial collapse. The heart of our problem can be seen as a tragedy of the commons. That’s a set of circumstances when something is commonly owned and individuals acting rationally in their own self-interest produce a set of results that’s inimical to everyone’s long-term interest. Let’s look at an example of the tragedy of the commons phenomenon and then apply it to our national problem. Imagine there are 100 cattlemen all having an equal right to graze their herds on 1,000 acres of commonly owned grassland. The rational self-interested response of each cattleman is to have the largest herd that he can afford. Each cattleman pursing similar self-interests will produce results not in any of the cattlemen’s long-term interest — overgrazing, soil erosion and destruction of the land’s usefulness. Even if they all recognize the dangers, does it pay for any one cattleman to cut the size of his herd? The short answer is no because he would bear the cost of having a smaller herd while the other cattlemen gain at his expense. In the long term, they all lose because the land will be overgrazed and made useless. We can think of the federal budget as a commons to which each of our 535 congressmen and the president have access. Like the cattlemen, each congressman and the president want to get as much out of the federal budget as possible for their constituents. Political success depends upon “bringing home the bacon.” Spending is popular, but taxes to finance the spending are not. The tendency is for spending to rise and its financing to be concealed through borrowing and inflation. Does it pay for an individual congressman to say, “This spending is unconstitutional and ruining our nation, and I’ll have no part of it; I will refuse a $500 million federal grant to my congressional district”? The answer is no because he would gain little or nothing, plus the federal budget wouldn’t be reduced by $500 million. Other congressmen would benefit by having $500 million more for their districts. What about the constituents of a principled congressman? If their congressman refuses unconstitutional spending, it doesn’t mean that they pay lower federal income taxes. All that it means is constituents of some other congressmen get the money while the nation spirals toward financial ruin, and they wouldn’t be spared from that ruin because their congressman refused to participate in unconstitutional spending. What we’re witnessing in Greece, Italy, Ireland, Portugal and other parts of Europe is a direct result of their massive spending to accommodate the welfare state. A greater number of people are living off government welfare programs than are paying taxes. Government debt in Greece is 160 percent of gross domestic product. The other percentages of GDP are 120 in Italy, 104 in Ireland and 106 in Portugal. As a result of this debt and the improbability of their ever paying it, their credit ratings either have reached or are close to reaching junk bond status. Here’s the question for us: Is the U.S. moving in a direction toward or away from the troubled EU nations? It turns out that our national debt, which was 35 percent of GDP during the 1970s, is now 106 percent of GDP, a level not seen since World War II’s 122 percent. That debt, plus our more than $100 trillion in unfunded liabilities, has led Standard & Poor’s to downgrade our credit rating from AAA to AA+, and the agency is keeping the outlook at “negative” as a result of its having little confidence that Congress will take on the politically sensitive job of tackling the same type of entitlement that has turned Europe into a basket case. 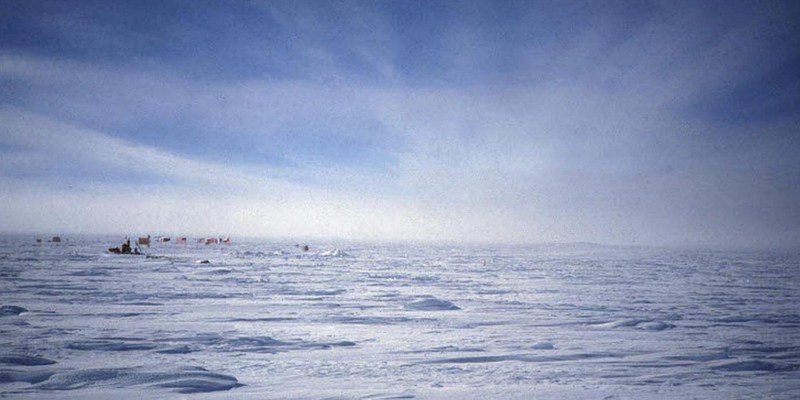 I photographed this background image of the South Polar Plateau during my winter-over at the South Pole in 1981-82. You can see the ceremonial circle of flags in the left middle. Learn more about my thirteen-month sojourn at the Pole here<?strong>.